Hello Stampers! It's time for CCM's new challenge and a freebie for you to use. I love this adorable fairy bunny image. I used Flourishes' sketch for my card. The border punch is from Martha Stewart. After I colored the image I added stickles to her wings and wand. I finished off my card by adding the pink pearls. Please head on over to the CCM Challenge blog for more DT projects and enter to win some fabulous prizes from the shop. 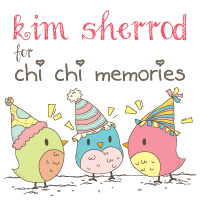 Another cute card Kim! Love the soft colours. 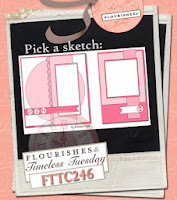 Thanks for playing along with both sketches at Flourishes Timeless Tuesday this week. Awww, this is such a sweet card! I like the soft coloring on the image and all the different girly dp's are beautiful together! Thanks so much for playing along with us in the Timeless Tuesday Challenge this week! Good golly Kim that's a cute card! What a cute stamp image and such great soft colours. Great use my sketch this week. Thanks for playing along with our Timeless Tuesday Challenge this week. Lovely soft, subtle colours and the cutest little rabbit! I really like your card! Thanks for playing along with ASM this week! !